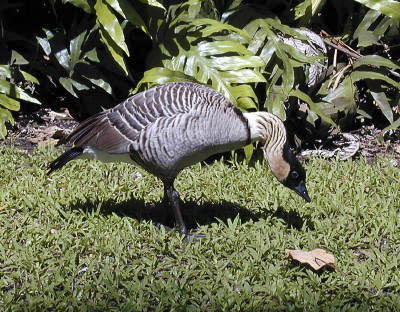 W. H. Shipman’s logo depicts a pair of nene, the endangered Hawaiian goose (Nesochen sandvicensis). These birds were near extinction in 1918 when Herbert C. Shipman began an effort to save them by starting a breeding program at his Kea’au home. He later provided birds for other programs including the State of Hawaiʻi effort at Pohakuloa (now located at Olinda, Maui) and the program run by the Wildfowl Trust in England. The story is told in the National Geographic, November 1965, article titled “Saving the Nene, World’s Rarest Goose”. The Shipmans have always taken their responsibility for land stewardship seriously. All of Shipman’s sugar leases prohibited removal of breadfruit, coconut and other food producing trees. Willie Shipman, in writing those sugar leases, would not allow the sugar mill to be located at the ocean because residuals of cane production (i.e. cane husks, mud, etc.) would foul the nearby ocean environment; instead the mill was located inland and these products were recycled via an elaborate canal system producing ever more fertile agricultural land. Today, Shipman designs roadways on its land to ensure that particular trees and other locally important objects remain in place. To promote sustainability, Shipman’s current master plan ensures a balance of agricultural lands with developing lands. Working with Na Ala Hele, the State’s trail stewardship organization, the Company has helped to stabilize and upgrade trails leading through its property and has built parking facilities on its own land at the trail head. The native Nene continues to be protected as part of a program with the government.